Belfast Metropolitan College, the largest further and higher education college in Northern Ireland, recently opened its state-of-the-art building located in Belfast’s prestigious Titanic Quarter. This large multi-storey building features the latest technology and facilities, all fully supported by a Molex PowerCat™ Category 6A U/FTP copper cabling infrastructure with an OM3 fibre backbone. One of Europe’s largest and most spectacular waterfront urban regeneration projects is the Titanic Quarter in Belfast, Northern Ireland. It is set to become a major social and business meeting hub with galleries, theatres, parklands and water sports all easily reached from Belfast’s city centre. The Titanic Quarter has also recently been chosen as a test site for a new cloud computing system, leading Enterprise Minister Arlene Foster to comment that this will play a major role in helping to position Northern Ireland as a worldwide centre of excellence in cloud computing. 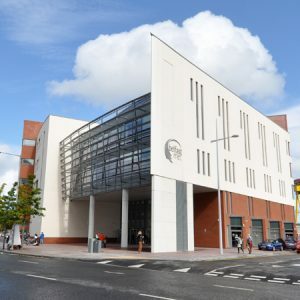 In May 2009 as part of its commitment to developing lives by providing exceptional education and training in Belfast and Northern Ireland, Belfast Metropolitan College broke ground on its new £44 million Titanic Quarter campus. Spread over 22,000m² and covering five floors, this landmark building comprises over 180 classrooms and offices, eight production and training kitchens, four hairdressing and beauty salons, a fitness suite, multiple restaurants and a bar catering to 2500 students. The site, which replaces two former Belfast city centre sites, impressively incorporates industry leading facilities while maximising the availability and scope of Information Technology to support its student base.